A few months ago (5/29/17) while driving through Orange County down the I-5, something caught my eye in what looked like the parking lot of a mall. 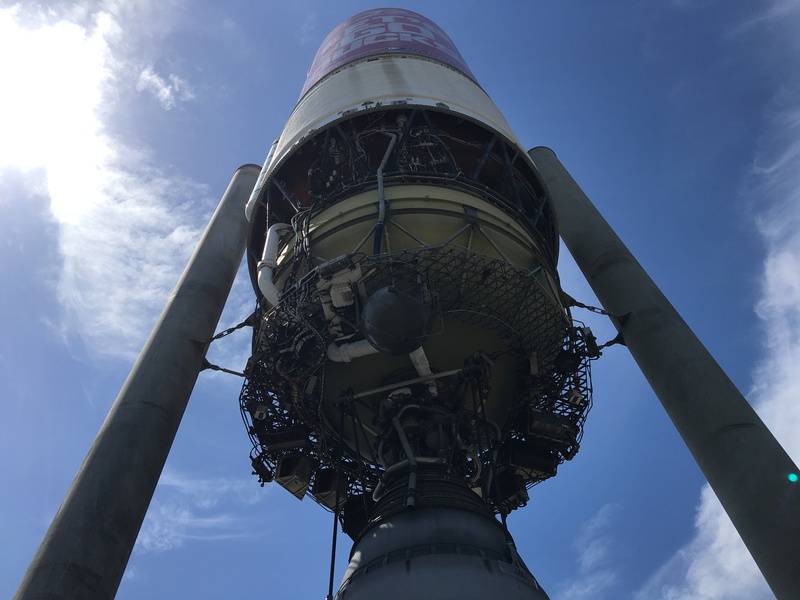 An RL-10B-2 upper stage rocket is on permanent display adjacent to the Discovery Cube of Orange County! This massive item from a Delta III rocket is an amazing piece of American rocketry history and was donated by the Boeing Company facility at Huntington Beach, CA. 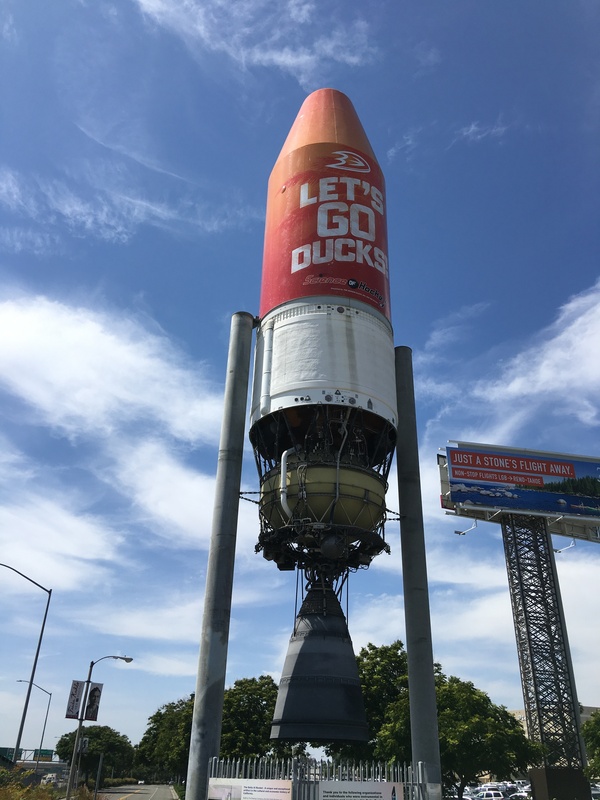 From the photo above, it seems the museum has used the payload fairing to advertise the Anaheim Mighty Ducks. The Discovery Cube is a group of museums open to the public (10am – 5pm) for children of all ages. They have three locations in Los Angeles, Newport Beach and Santa Ana (Orange County). 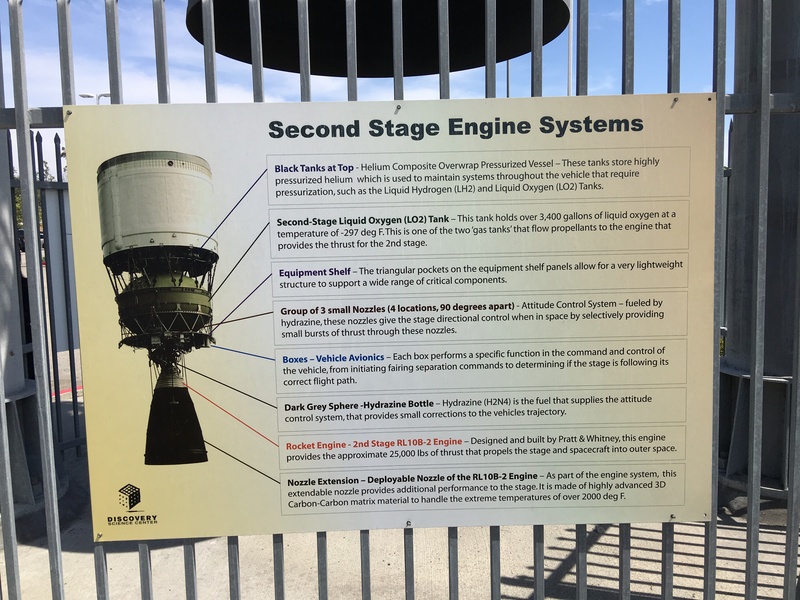 The RL-10 series has one of the longest histories of rocket engines dating back to the 1960’s and is still in service over 50 years later. 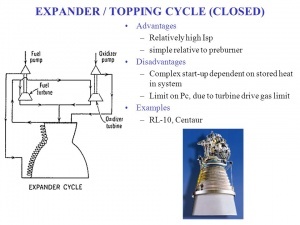 This trail-blazing design of a hydrogen-oxygen cryogenic upper stage uses an expander or topping type of engine cycle which is very efficient and useful for smaller upper stage engines, but very different from the more common gas-generator or staged combustion cycles used on first stage engines. 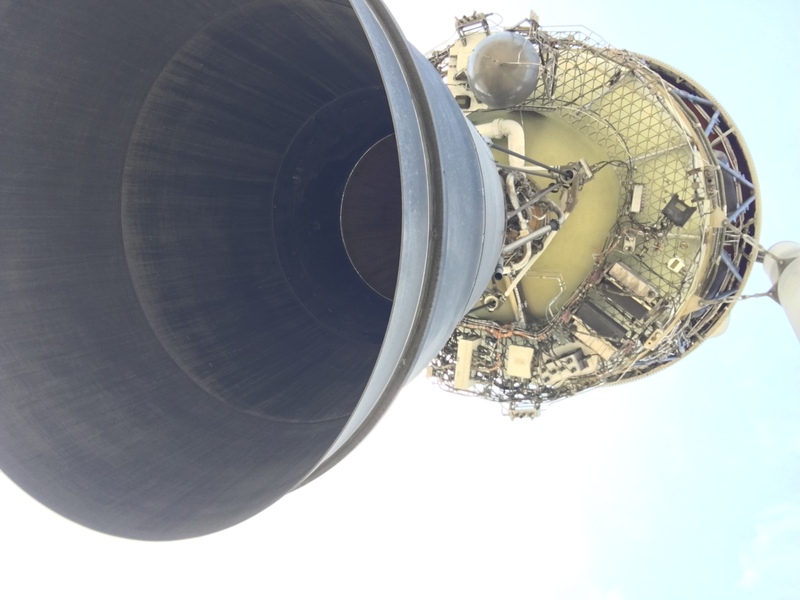 This particular upper stage looks largely complete with propellant and pressurant tanks, valves, avionics boxes, steering rockets, payload fairing and of course the expander-cycle engine all mounted high above the street giving passersby a great view from below and afar. 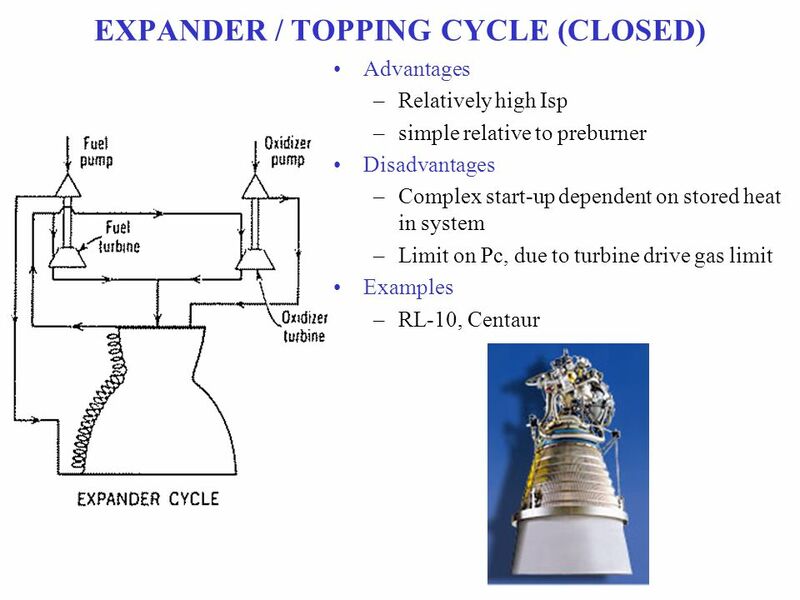 Also, the RL-10 has an extendable nozzle that is deployed after stage separation. The display has the long bell nozzle in the deployed position showing how it would look as it operates optimally in the thin upper atmosphere moving its payload to orbit. 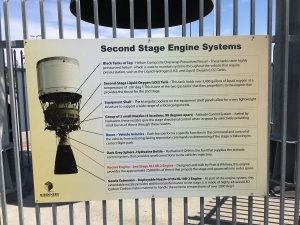 The RL-10 is still being built by the Pratt & Whitney facility of West Palm Beach, FL (now under Aerojet-Rocketdyne). The museum has also the Boeing Rocketry exhibit which is unfortunately still closed for renovation. From the photos on the museum webpage, they had an RS-68 engine on display which people could walk beneath to take a closer look. The RS-68 and RS-68A engines are still being made by Aerojet-Rocketdyne of Canoga Park, CA. Once the rocketry exhibit is reopened, I plan to pay this museum a visit. I encourage our readers to do the same.